MintLife Blog > Trends > 41 Percent of Americans Pinch Pennies When Dining Out With Friends: Technology to Blame? Technology has transformed the way we dine out in groups. Gone are the days when friends take turns treating each other to nights on the town. Now that apps make money accessible everywhere, tabs are paid down to the cent and cost discrepancies are settled by payment requests sent straight to your phone. This begs the big bill question: Is this technology making our friendships more transactional, or more fair? 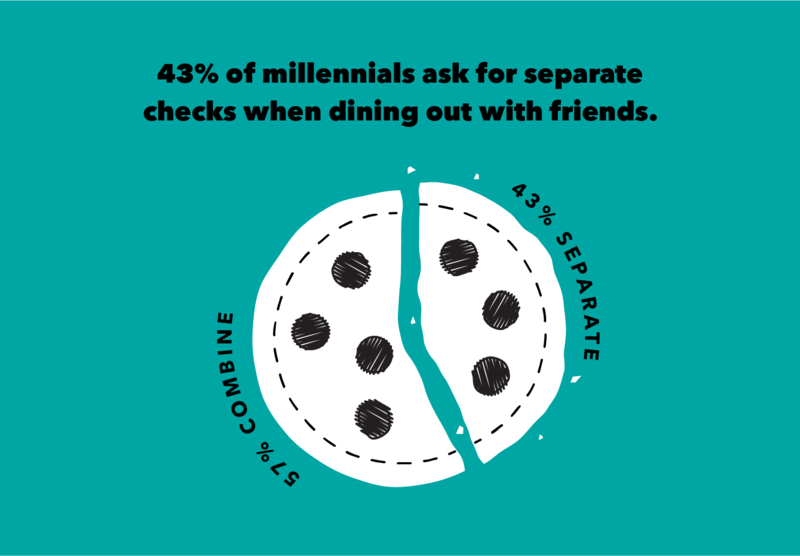 We ran a survey on how Americans split the bill when dining out with friends. While asking for separate checks used to be considered a faux paus when dining out, it is now becoming the new normal. Take it from the generation that eats out most: 43 percent of millennials surveyed said they would ask for separate checks when dining out with friends, and it’s not because they are frugal with their budgets. In fact, a Food Network study revealed that millennials are more likely to spend money on dining out than on their life savings. According to the New York Times, new technology is likely to blame. Most servers now use programs that can compute and divide up checks in seconds. And when a restaurant can’t split the check, young diners will turn to cash apps to square up — 65 percent of young people use cash apps regularly to exchange money with friends. If your group does plan to ask for separate checks, tell the restaurant when you book the reservation and remind the waiter at the beginning of the meal. If there are more than six diners, it’s best not to ask for itemized checks. While a common rule of thumb is that, unless discussed ahead of time, diners should expect to split a tab equally, research suggests most diners don’t actually do this in practice. 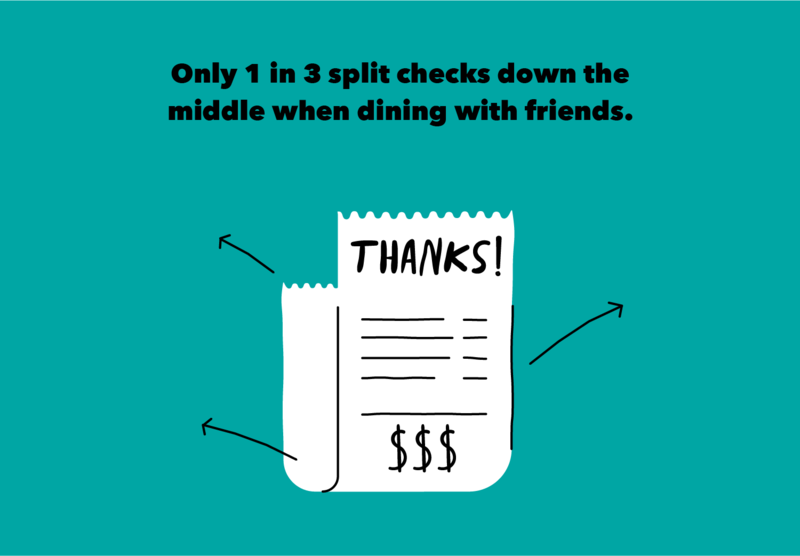 In fact, two-thirds of those surveyed do not split the bill evenly when dining out with friends. This is good news for people on a tight budget. After all, saving money is a whole lot easier when you’re in control of your own receipt destiny. But it’s bad news for traditionalists who crave communal, less transactional group dining experiences. If you do plan to split your bill down the middle you should avoid racking up a significantly higher bill than your fellow diners, so ask before ordering appetizers or dessert and order drinks in rounds. Some old habits die hard. Even in an era where gender norms are being challenged and women are seeing influxes in their paychecks, young men still feel pressure to pick up the tab. 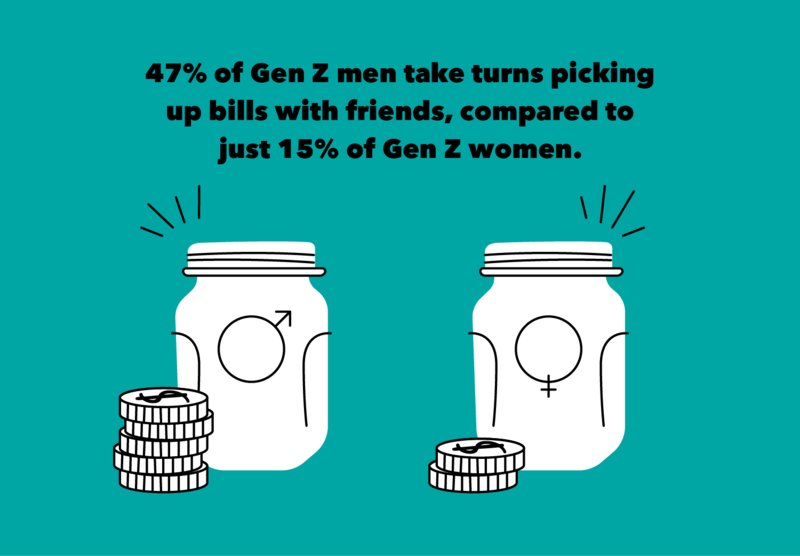 In fact, 47 percent of Gen Z men indicated they take turns picking up bills with friends, compared to just 15 percent of Gen Z women. It’s worth noting that the average woman still only earns 80.7 cents for every dollar a man earns. Men’s bigger salaries may translate into more generosity when dining out: In addition to being more likely to foot a bill, men statistically leave bigger tips than women. In heterosexual relationships, men also still face more pressure to pay on the first date. Even though etiquette dining guidelines state that the invitee should front the bill, 78 percent of people surveyed believe men should always pay on the first date, regardless of who invited who. In all, multiple factors play a role in how we dine out and square up with friends. And while new technology turns settling up into a simple transaction, it’s also making us less generous when dining out with friends. Even as attitudes around dining out change, there are still some steadfast guidelines you should follow when you’re paying the bill. One small misstep when the check arrives can have you appear rude, tacky or even unempathetic to your fellow diners. Learn how to navigate paying the bill in these five common dining scenarios using the infographic below. This study consisted of one survey question conducted using Google Surveys. The sample consisted of no less than 1,000 completed responses per question. Post-stratification weighting has been applied to ensure an accurate and reliable representation of the total population. The survey ran during March 2019.